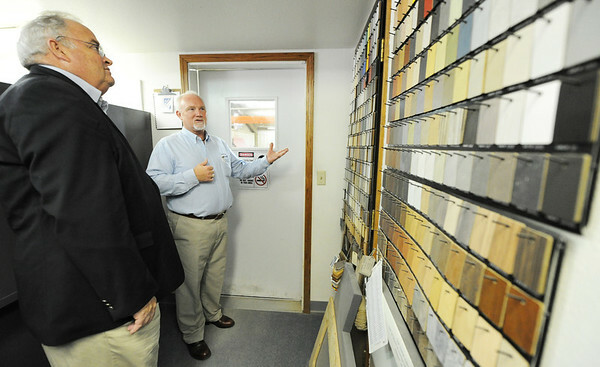 Congressman Billy Long (left) listens as Curt McCoy, co-owner of MSW Restaurant Furnishings in Carterville, talks about the wide variety of fabric color options available to their company's customers Wednesday morning, May 29, 2013. MSW supplies more than a dozen restaurant chains with furninshings, including Taco Bell, KFC, TGI Fridays, Moe's and many others. Long was leading a tour of Southwest Missouri manufacturers with the Missouri Association of Manufacturers.